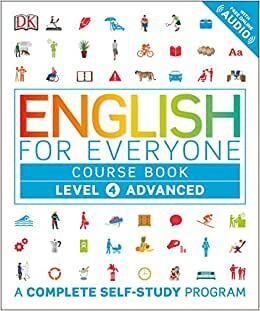 English for Everyone: Level 4: Advanced, Course Book covers the language skills, vocabulary, and grammar needed for the major global English-language exams, including TOEFL. All learning is practiced across speaking, listening, reading, and writing exercises, offering rounded preparation for work, travel, study, and exams. Download the free app and practice online with free listening exercises at www.dkefe.com. 5.0 颗星，最多 5 颗星Excellent ESL series! I teach ESL to adults, and I have been very happy with the English for Everyone series. I augment the lessons with some additional worksheets, emphasizing vocabulary and grammar. And we read from what one of my students calls "story books" - those stories provide additional vocabulary and fluency in reading aloud. The English for Everyone series provides structure for us, as I try to make sure that many aspects of English grammar are covered. Love this series - just bought the first book for my friends in India who are trying so hard to improve their English! I bought this item to help a friend learn English, and to help me to help him pass a required test to get a work permit. It is geared to that specific test, so I hope it helps! I am so happy I found it . Its exactly what I wanted and had been looking for ages ! Love this book. It looked the new book.